Remember that we went to Madrid? Well at that time we were doubting between Madrid and Barcelona. But now finally I could see what everybody was talking about, there is so much to see and to do. 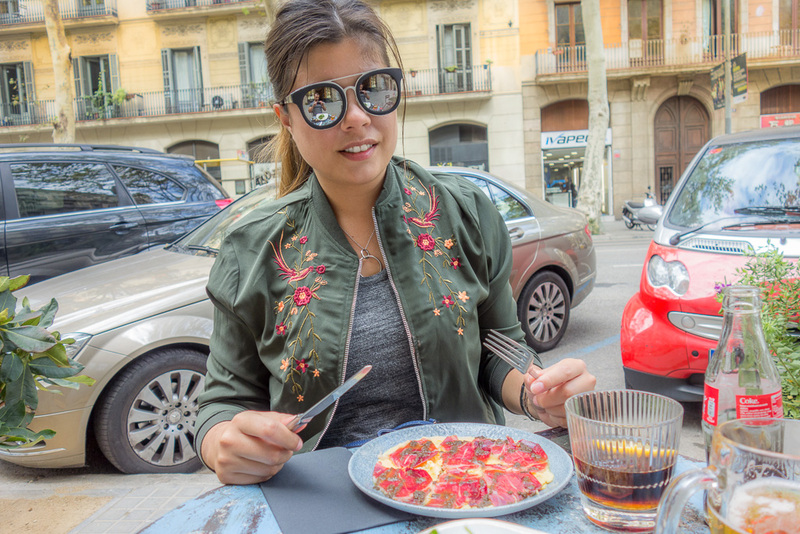 Last September I escaped on my birthday and went on a city trip to Barcelona with Maarten for a weekend. But at that same weekend was also la mercé festival, an amazing festival in honoring the Virgin of Grace. That means that the whole city is alive more than ever! In the evening you could find all sorts of dance performances and even fire ‘dancing’, they do ask to cover your body as it can get dangerous. Sadly we missed this because we landed later that evening. It’s also THE festival where you can see the ‘human tower’ but it was impossible to get even around the corner, so crowed! We took the metro which in Barcelona is pretty easy and has a stop at the airport too. Our stop was at the Arc Du Triumph and 2 streets further was our accommodation. So our location was pretty good, even on foot everything was doable. We knew that there was a festival but we were not aware of where everything was going to be, so we just checked in and headed to Arc Du Triumph in the hope to find some food. And lucky for us the street food market was right in the middle of the park at Arc Du Triumph. We ‘planned’ our trip or let’s say we knew what we wanted to see. So we woke up on time to get an early start at the day. We started the day at Park Guell or that was the plan. There was a sign that the next tickets were available for the late afternoon. What a bummer and a waste of time! We left grumpy and headed to the centre instead. There were so many people due to the event of the ‘Human tower’. We all got redirected to a different route, eventually we just wanted some space so we had lunch and headed to the beach. 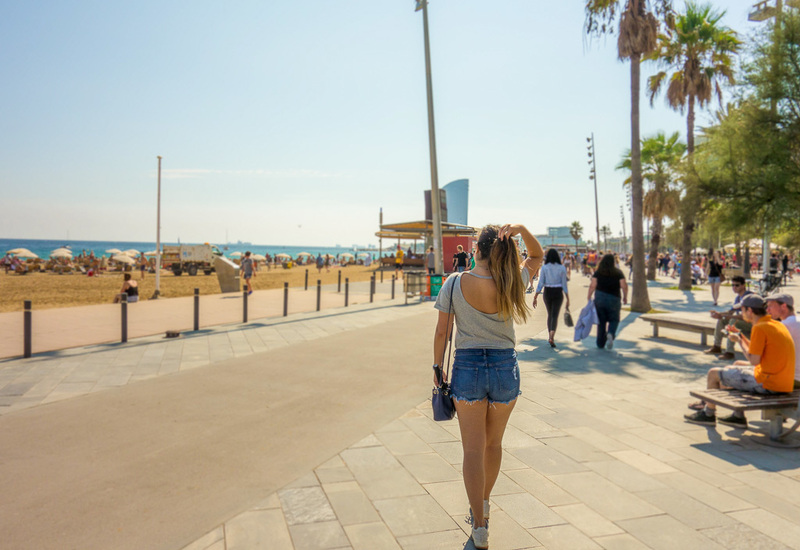 Barcelona beach is pretty cool because it’s literally 5 min from the centre by foot and most large cities don’t even have a beach so close. A wide area to relax and have a swim or just walk the boulevard and have a drink. Personally I don’t recommend eating here. Not that it’s not good but more because it’s pricier. After we cooled down with gelato and let our frustrations go we headed to the famous Las Ramblas. To be complete honest, it is just a street where you can do some shopping, eat & drink. It’s really crowed and I’m not that really a fan, but I guess that’s because of the festival that was going on that weekend. 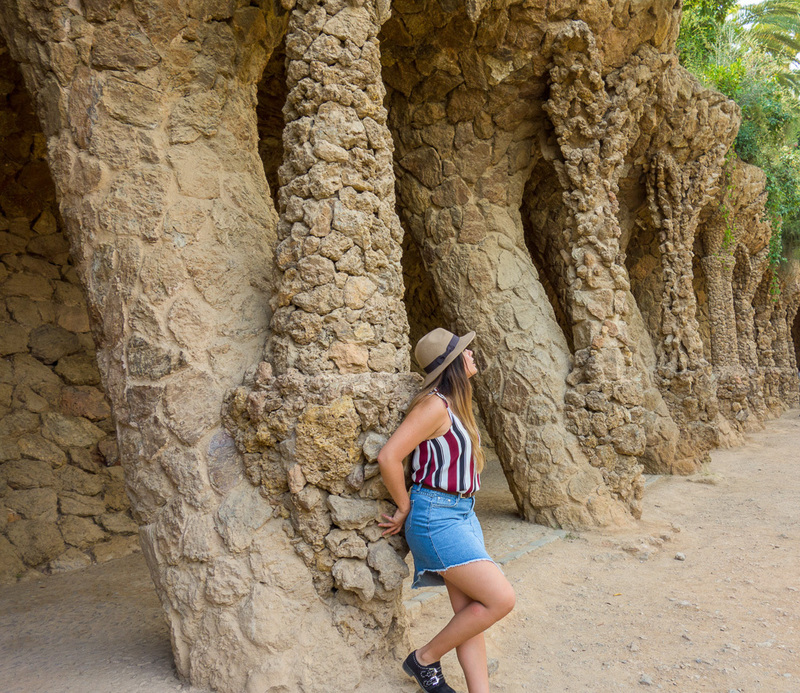 The next day we did a second attempt for Park Guell (we bought a ticket online the evening before and even than it was a close call), It was so beautiful! What a piece of art that park is! Too bad they were renovating some parts of the terrace, it was really pretty and worth the walk! Just remember there is a time table and once out of the area you can’t get back in even if you have ticket. 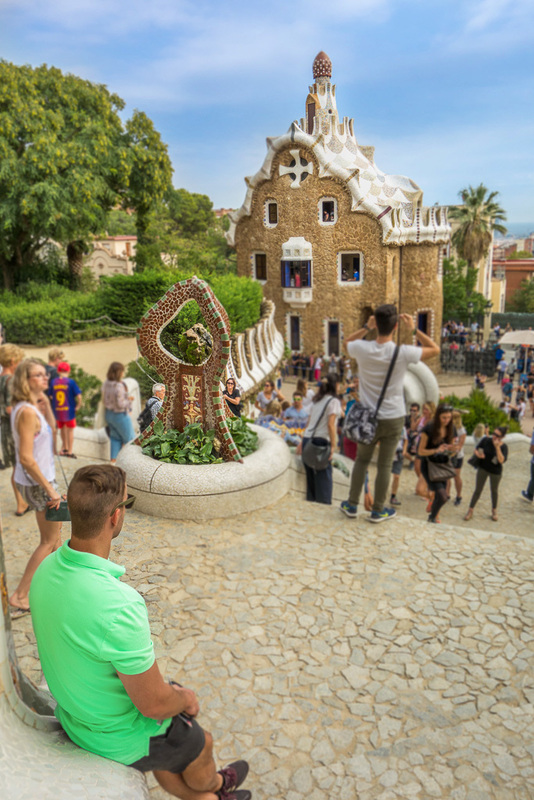 We were in an artistic mood and headed to the next piece of art of Gaudi! The famous Casa Batllo, Just 1 word ‘WAUW’ I love how he worked with the colors! I wanted to get a peek inside but again there was a small problem. There were no tickets available at the time we were there and sadly there was a super long line. Our time schedule didn’t allowed us to go for the next day as we were leaving in the afternoon. We even checked if we could visit ‘Sagrada Familia’ but even if we booked this at home it was full until 2 days after we were back home, can you imagine how crowed and busy it was. But we were more bummed out that we couldn’t see Casa Batllo because the prices for Sagrada Familia was crazy expensive. Yes I know they’re still working on it but seriously, other amazing cathedrals are a lot cheaper and some for free and also a piece of art! At least we saw the outside and I understand why people from all over the world want to see it. There were busses with tourists on the corner and I’m not exaggerating. 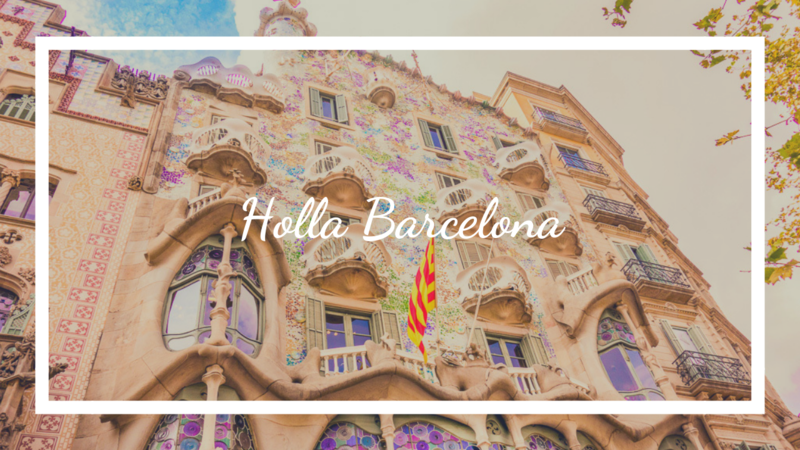 What did I learn about Barcelona? Well, I think we underestimated how busy it was going to be during the festival. It bothered us that it was so crowed, the bicycle tours didn’t even bother to ride on the righteous path and almost ran us over. A friendly couple stopped us in the metro to warn us that there were people watching my camera, so you can say we didn’t feel completely safe. We also learned that a 10 way metro card is enough because it was all doable by foot so that makes it cheaper as-well. 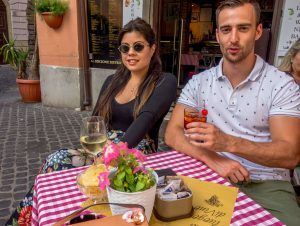 We understand why cities in Barcelona are angry at us tourists. Normally we always say to get tourist attraction tickets at the spot but in this case we strongly suggest to get your tickets online and check at home at the time-table. 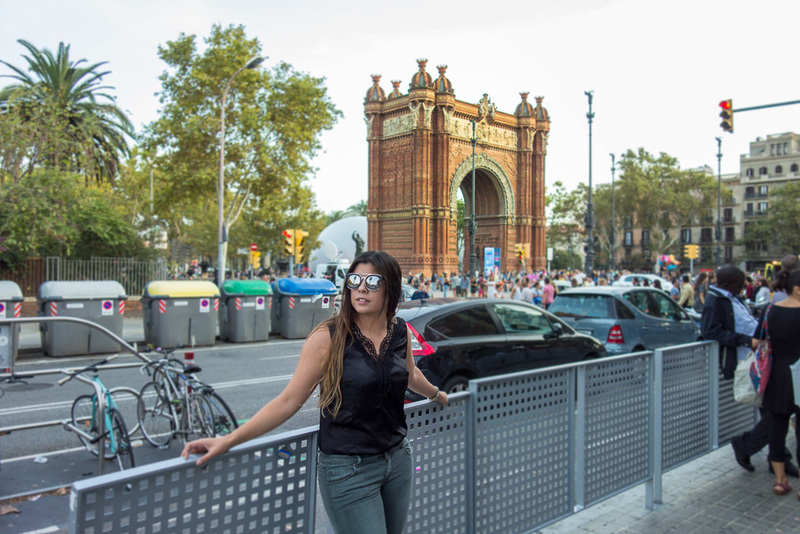 Barcelona is such a beautiful city, there is so much to see and learn. Too bad we were there at the wrong moment.